Problem: you want to sniff packets from many SS7 signalling timeslots on many E1/T1s at the same time and analyse them with Wireshark. Until now, the only way to know which packet came from where was to look at the DPC/OPC. Why? Because the PCap file format, used by Wireshark, tcpdump and many other tools, doesn't have any way to keep track of which interface a packet came from. Solution: PCap-NG is a completely new file format which lets you keep track of which interface a packet came from. 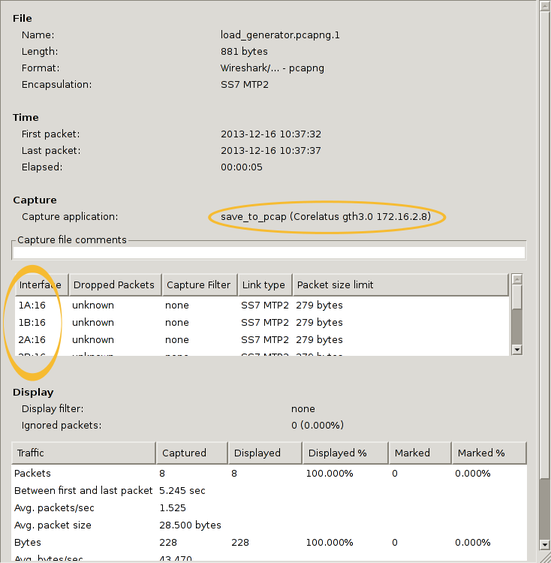 Wireshark understands PCap-NG (and, of course, classic PCap). The C sample code from Corelatus includes a program called 'save_to_pcap' which takes SS7 packets from Corelatus E1/T1 and SDH/SONET hardware and translates them to PCap so that Wireshark can read them. select "Field type: Custom" and "Field name: frame.interface_id"
There's actually more information in the PCap-NG file. Wireshark shows it in the Statistics/Summary menu. This shows you the full interface names, i.e. 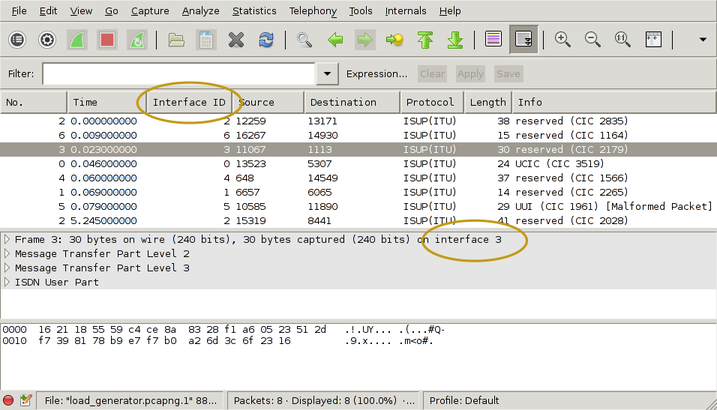 "interface 1" is actually E1/T1 port 1B, timeslot 16 and you can also see exactly which GTH the capture came from. You can also use 'frame.interface_id' in filter expressions. The PCap-NG format is nicely designed, much better than the original PCap format. Had PCap-NG been around 13 years ago, we probably would have made GTH output traces directly in this format. It's flexible enough to let us include all sorts of information, e.g. we could even add layer 1 status changes on a separate "interface". It looks like live captures in Pcap-NG format don't work. Wireshark just says "unknown format". You can work around that by reverting to the classic format, using the -c switch on save_to_pcap. The C sample code is here and also on github.